True to its namesake, Vedge in Philadelphia is a destination for inspiring plates of vegetable-based cuisine. In fact, Vedge is self-described as “a vegetable restaurant.” The iconic cooking of chefs and owners Richard (Rich) Landau and Kate Jacoby has landed them heaps of praise from vegetarians, omnivores and culinary institutions alike. The kitchen duo now have three Philadelphia restaurants, including V Street (a concept featuring global vegan street fare) and Wiz Kid (a playful vegetarian take on cheesesteaks and other fast, casual food). With nods from the James Beard Foundation and a victory on Food Network’s Chopped, chef Rich has earned prestige in the culinary world through vegetarian cooking. Naturally, chef Rich is a great source of knowledge for working with vegetables in the kitchen. 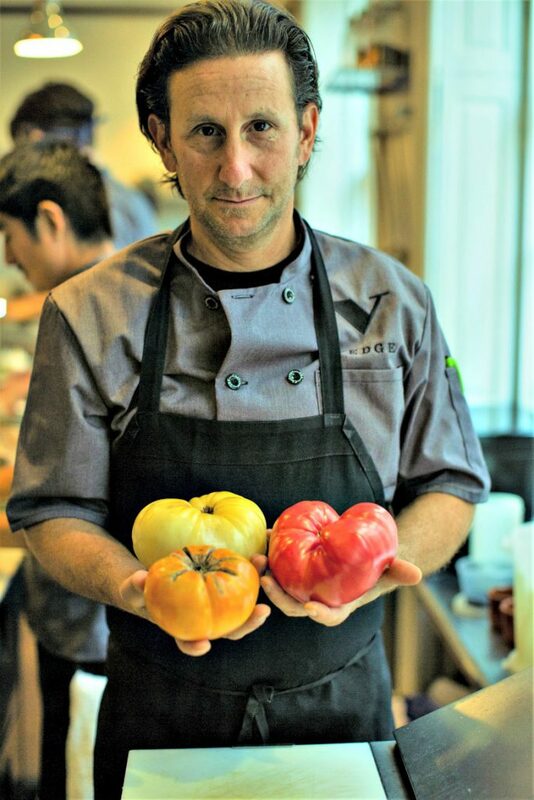 Here are his tips on working with great local tomatoes and a recipe for an inspiring Heirloom Tomato Salad from his cookbook, Vedge: 100 Plates Large and Small That Redefine Vegetable Cooking. Get the best tomatoes you can find—make sure they are still a little firm and not mushy. Always wait to cut your tomatoes until right before serving them, and use a very sharp knife to keep the juices locked in. Enjoy tomatoes raw, sprinkled with flaked salt and coarse pepper or drizzled with olive oil. Forego adding vinegar so that the natural acidity of the tomato can shine through. For cooking, look for plum tomatoes and roma tomatoes. A fresh tomato sauce takes only about 30 minutes to cook. Saute garlic and onion, add chopped tomatoes, season and cook into a chunky paste. You can add a little water and olive oil and simmer for longer before finishing with fresh herbs. This simple sauce is great on anything and is also a versatile base for Latin, Spanish, French, Moroccan and Greek sauces. You can also can your own tomatoes for rich sauces later on. Pairing tomatoes with basil is so timeless that it’s hard to resist. Tomatoes also go great with dill and olives, or raw red onion for a crunchy counterpart. For an Asian touch, try shiso leaf with some toasted sesame seeds and a drizzle of good-quality tamari—it eats like tomato sushi.